in the city from the standpoint of continuous service. The Church was originally located at the corner of Green Springs Highway and Oxmoor Road on land donated by some of the first members. A total of four different buildings were erected on that property during the eighty-four years the Church was at that location. The construction of Interstate 65 forced the Church to relocate in 1967 to the present property on Columbiana Road and new facilities were constructed. An addition was completed in 1983. All property is debt free. When the Cumberland Presbyterian Church and the Presbyterian Church USA voted to unite in 1906, Homewood Church voted to remain with the Cumberland Presbyterians who refused to enter the union. A group loyal to the union left Homewood Church and six years later formed Edgewood Presbyterian Church USA. Homewood Church has had a rich heritage in Homewood and has had a great impact on the city over the years. Her members have served as members of the City Council, Fire Department and Chief, Police Department and Chief, educational leaders, members of many city boards and in other capacities. For many years, the Zelesophian Academy was part of the Church and many of the early leaders in the area received their education there. One of its leading teachers was the Rev. J.H.B. Hall, for whom Hall Avenue and the Hall-Kent School are named. For ninety-six years the Church was known as the Oak Grove Cumberland Presbyterian Church. 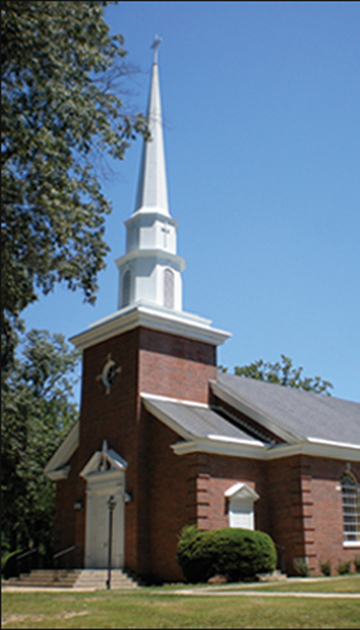 Birmingham Presbytery changed the name to Homewood Cumberland Presbyterian Church in 1979. Copyright 2013 The Joy Gallery at Homewood Cumberland Presbyterian Church all rights reserved. No part of this site may be reproduced, stored in a retrieval system, or transmitted in any form or by any means (electronic, mechanical,, photocopy or otherwise) without the expressed permission of The Homewood Cumberland Presbyterian Church.